In the immediate aftermath of the 9/11 attacks, activity at the former World Trade Center site was devoted to recovery and rescue operations. 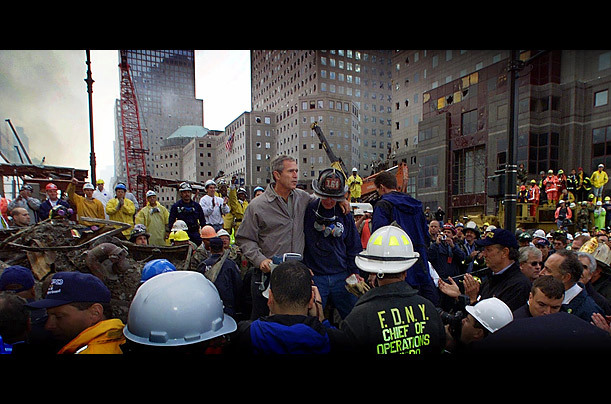 Three days after the tragedy, President Bush climbed to a perch on the wreckage, referred to at the time as "the Pile," and spoke to rescue workers and the nation through a bullhorn. "America today is on bended knee," Bush said in what was probably the first moment of national mourning, "in prayer for the people whose lives were lost here, for the workers who work here, for the families who mourn." The workers at the site responded by chanting, "U.S.A.! U.S.A.!"